Wife of Nigeria’s President, Aisha Buhari on Wednesday sued Governor Ayo Fayose of Ekiti State for claiming she was involved in the Halliburton scandal. 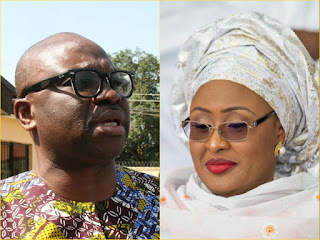 Mary Ekpere, counsel to Mrs. Buhari, prayed the court for the lawsuit to be served on Mr. Fayose and his two aides, even though Ekiti State is outside the jurisdiction of the Abuja Division of the FHC. Mr. Adeniyi approved the service be done through a courier service, DHL, or “by publication in the online media platform” court filings say.